Lock one drive control on ALL skid loaders. Works with enclosed cabs too. The E-Series Lock, which locks one drive control lever, mounts permanently on the cage by "sandwiching” two plates on the cage. In the case of enclosed cabs, the locking plate is installed on the outside of the cab and the 3/16" thick mounting plate is put on the inside (this allows the glass to slide past it while operating the machine). A window must be open only while the lock is installed. The E-Series Lock is permanently attached with 4 non-reversing stainless steel screws. 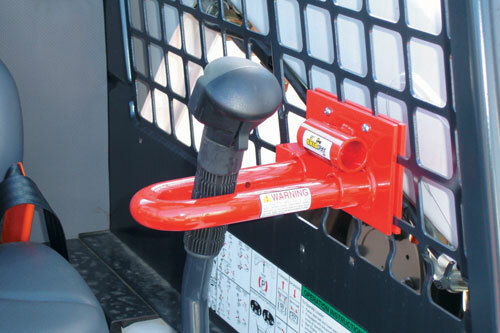 The "U-bar" captures one drive control lever and locks into the locking plate (which is secured on the cage) therefore securing the machine. No keys are required for the product selected with the optional combination lock. When the product is unlocked, set the four dials to the numerical code you wish. Change the combination at any time you like when the product is unlocked. It is recommended that you write down your combination and keep it in a safe place. 1 Year Warranty on workmanship and defect. Do not guarantee replacement cost of stolen property of any type.